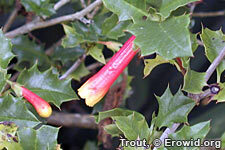 Desfontainia spinosa is a small evergreen shrub native South America. The leaves and fruit are made into a hallucinogenic tea. There is little specific info about the use of this plant as a psychoactive.